Preliminary Chart of the Entrance to Matagorda Bay Texas. This is an appealing mid-19th century U.S. Coast Survey nautical chart or map of the entrance to Matagorda Bay, Texas. The map covers the Texas coastline from Power Horn Lake and Chocolate Bay eastward as far as Trespalacios Bay, including Lavaca, Lavaca Bay, and Indianola, Texas. 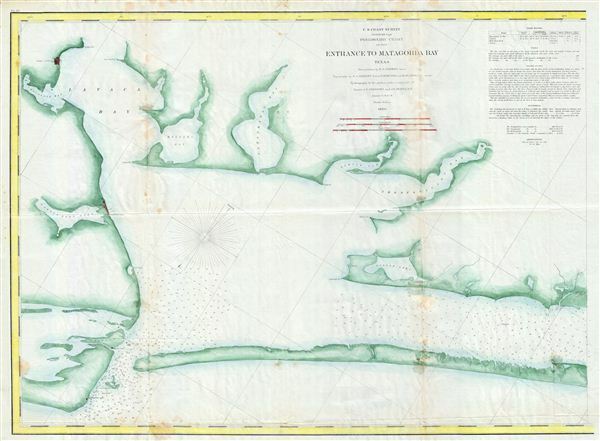 This chart offers some of the Coast Survey's earliest work in this region. The map features numerous depth soundings. Sailing instructions and notes pertinent to the mariner appear in the upper right quadrant. The triangulation for this chart was accomplished S. A. Gilbert. The topography is the work of S. A. Gilbert, W. H. Dennis and M. Seaton. The hydrography was completed by a party under the command of J. C. Febiger and J. K. Duer. The whole was compiled under the supervision of A. D. Bache, one of the most influential and prolific figures in the early history of the U.S. Coast Survey. Bache, A. D., Report of the Superintendent of the United States Coast Survey, Washington, 1860. Very good. Slight discoloration near margins and folds. Blank on verso.